Now when you navigate to your page you will have a clickable bar at the top that will list all variables available to the page when it loads, which you can access via the code in your theme page template if you want. This entry was posted on Saturday, March 14th, 2009 at 10:59 pm	and is filed under Drupal, Programming, Tips. You can follow any responses to this entry through the RSS 2.0 feed. Both comments and pings are currently closed. hey….just a friendly tip. next time, put in 5 minutes of research before writing articles like this. 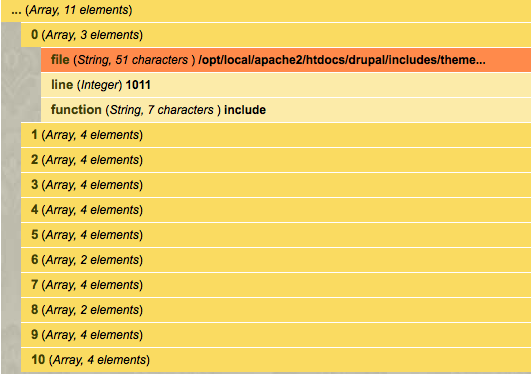 the function you have called, dpm(), is not built-in to drupal, it comes with a module called devel. and if you have that module installed, you don’t really have to do all this manually, you can just check out the dev_load and dev_render tabs on each page…. Thank you for pointing out the Dev Load and Dev Render tabs for those that may not have been aware that they existed. However, I would give you the same advice. If you took 5 minutes to read my article you would have discovered that I say dpm() is part of the Devel module in the first paragraph. Also, using the Devel tabs as you suggested only gives access to the properties of the $node object, whereas dpm( get_defined_vars() ); returns all variables available to a particular Drupal page. Additionally, Dev Load and Dev Render do not provide page backtrace information. Perhaps you could contribute to the community knowledge base and write a post on Dev Load and Dev Render and post a link to it in the comments here? I found this article informative and handy. Thanks. I too found this “informative and handy”. I’m new to drupal and web development and little tips like this help a lot. Thanks. I’d have to look into it… but for the sake of giving you a quick reply, if you click on the devel tab I would think the arrays would become available as variables for the page, in which case you could view them using dpm( get_defined_vars() ); as above. Excellent article – very useful!! I wanted to see the variables in a view, but the dev tabs don’t appear in a view, so I coded them into the views-view-grid.tpl template, then the views-view-fields.tpl template, and was then able to see the variables I needed to add some graphics to the view output. 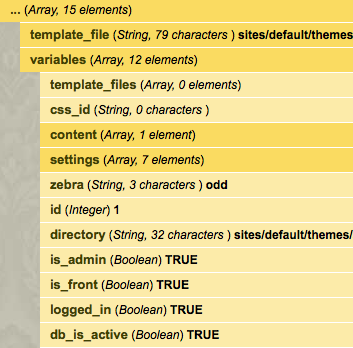 Tabs are nice, but sometimes you have to code the dpm(). Hiya, thanks for the tip. A quick update, it looks like the backtrace func is now **ddebug_backtrace()** and it prints out by default, not needing the dpm() wrapper. Not sure when it changed.